Image caption Natasha Kirk said the stories and memories being shared about her father were "invaluable"
The daughter of a wrestling star who died in the ring when she was three has been looking to the wrestling community to help build memories of her father. Mal "King Kong" Kirk had a heart attack in front of hundreds of spectators as he faced Big Daddy at the Hippodrome in Great Yarmouth on 23 August 1987. 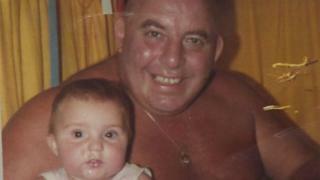 Daughter Natasha Kirk joined a Leeds Wrestlers Reunion event to find out more about her father. She said: "I don't remember my dad so I'm grateful for these memories." Ms Kirk said people had recounted stories about her father's sense of humour and how hard working he was. Image caption "King Kong" Kirk was described by Big Daddy as the "pitman's Hercules"
She said: "He was a household name and I think sometimes I forget that because I've grown up out of that limelight." Sharing his memories, fellow wrestler Tony "Banger" Walsh, described Kirk as a "big lump" who was "just a lovely, lovely guy". A former coal miner and professional rugby league player, Kirk was was born in Featherstone on 18 December 1936. Described by Big Daddy as the "pitman's Hercules", he started wrestling as "Mucky" Mal Kirk after his sporting career ended - spending time in Germany before returning to the UK and changing his ring name to "King Kong" Kirk. He always wrestled as the "baddie" and was often tagged with the superweight Giant Haystacks in matches against the "good guys". Unlike a number of wrestlers at the time, he did not rely on a gimmick, rather his 25 stone frame was considered intimidating enough in the ring. Kirk's death, aged 50, came just after Big Daddy, whose real name was Shirley Crabtree, had delivered his signature "big splash", which saw him jumping down on to the body of a fallen opponent. An inquest into his death found Kirk had a pre-existing heart condition and cleared Mr Crabtree of any responsibility. Speaking to the BBC at the time of his death, Mr Crabtree said: "He was a tremendously powerful man. He was as strong as three man. "As long as I live I'll never forget seeing him down there on the canvas instead of on his feet, raging and flying about." Ms Kirk said of meeting the wrestlers: "I can't have my dad in my life and I've grown up without him, so it's the next best thing because people are telling me what he was like." Why do wrestlers so often die young?